A child shivers in the night, discomfort keeping rest at bay. Too cold to sleep; it's a disquieting, harsh reality for many children. It's also a reality we're often not even aware of. I’m busy, you’re busy. Yet every once in a while, a photo, story, or news clip, manages to poke through the hedge of busyness surrounding us and we are pierced by the realization of another’s desperate need. I recently discovered Knit-a-Square. It’s an Australian based organization working to get blankets, caps and simple sweaters to orphaned or abandoned children who are desperately poor. So poor there’s often little more than a small fire in a hut to ward off the cold when night temperatures drop below freezing. Children who can’t sleep at night because they’re cold: I can hardly bear the thought. Though my own two boys are now adults, I cherish the memories of our nighttime routine when they were young. First, a soapy, splashy bath to wash off the dirt from a day’s play, then a good supper, and a little later it was off to bed, clad in soft, footed pj’s to keep them snugly warm. A bedtime story was generally required. Often requested was “A Day on the Farm”, a Little Golden book about Farmer Brown, his tractor, farm and family. I read it to them so many times, that even now, twenty some years later, I can still recite parts of the book word for word. At night my children were warm, well fed, read to, and loved. Would that all children’s bedtime was no less. It was with concern, a concern I couldn’t shake (nor did I wish to), that I read of the very different experience of many children in Africa. Children of the AIDS epidemic, literally millions of them, orphaned and unbelievably poor, often cared for by a relative who was not much better off than they were, and even some young orphans trying to be head of the household for their younger siblings. The color of these children, the politics of the region they live in, and the circumstances which orphaned them matter not one bit to me. What does matter is that a child is cold, and I can do something about it. And, if you'd like to join in the effort, you can too. How does a person sleep when shivering from cold? In our world we throw an extra blanket on the bed, revel in its cozy warmth, then drift contentedly off to sleep. What if we had no blankets? No warm clothes? I thought of my own children in that situation. Pictured them going to bed, and instead of giggling and snuggling up in the warmth after a bedtime story, what if they had lain there with the cold nipping at them, tossing uncomfortably, sleep elusive through the long night? When I learned of the Knit-a-Square organization it was too worthy a project, too easy an opportunity to pass up. Here is a chance to make a real, everyday difference in a child’s life - cold and miserable versus warm and cozy - by knitting or crocheting easy 8” x 8” squares. It’s doable, small, yet gives almost immediate help to someone. Mother Teresa said “We can do no great things, only small things with great love.” Making 8" x 8" squares is a small thing, but when our small efforts combine with the small efforts of other knitters and crocheters across the globe, the little bit we each do comes together to change the lives of many children. - It is estimated there are 11.6 million orphans in sub-Saharan Africa. 1.4 million live in South Africa. - Many of these children are orphaned or have been abandoned. Many live in great poverty in shack settlements. Some head up families of their siblings and other children, and some live alone, without shelter, in hills and dumps around the cities. - They need love, shelter, food, education and warmth. Many children’s charities are working hard to provide the first four. Charity knitting and crocheting can provide the last. 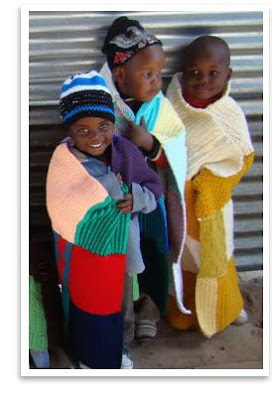 - This simple charity crochet and knitting project to make and send 8” squares, which are made into blankets for these children, takes little time, costs little and DOES make a difference. All while you do what you love - knitting and crocheting. - There are thousands of people making and sending squares from 32 countries around the world, but the need is so great, we implore you to join our army of charity knitters and crocheters as well. 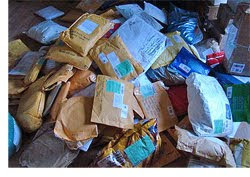 - Every square that is sent will be used in a blanket to keep an orphan or abandoned child warm. - Use your left over yarn scraps, join the knit-a-square crochet and knitting for charity project and your squares will soon be in blankets, keeping children warm. 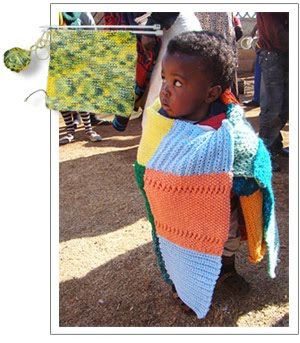 - Squares are mailed to South Africa where the women of the parish and other parishes within Soweto have set up the Soweto Comfort Club to collect, sort, bundle and stitch the squares into blankets and then distribute them to groups of children who are greatly in need. - Volunteers from countries all over the world, even school children, are busy knitting squares, caps, and simple vests and sweaters to warm the children’s bodies, and their hearts. These children receive two gifts: the gift of a blanket, accompanied by the gift of love. Someone cared enough to make a difference. - Knit-a-square furnishes easy patterns, even instructions on how to knit and crochet. If you like, you can subscribe to the blog to keep up with what’s happening, visit the website to see short videos of children receiving their blankets, sweaters and caps, and get email updates. The website address is: www.knit-a-square.com . Over the years of my crafting ventures I’ve amassed quite a bit of leftover yarn; often only small amounts, but too good to throw away. I’m glad I kept those leftovers - they're now being put to good use. Knitting squares, easy hats, and even a few simple sweaters is actually quite relaxing and fun! I often find a few minutes to knit while sitting in the doctor’s office, when I’m a passenger in a vehicle, while watching TV or any other time I catch a few minutes. I carry an extra little knitting bag with me most of the time - knitting squares doesn’t require a lot of supplies, and you never know when you might have an unexpected delay that you can put to good use. Fall is almost here. I look forward to its much anticipated cool days and invigoratingly chilly mornings. It's my favorite time of the year. Because I have adequate clothing and shelter, I don’t have to worry about being cold during the day or too chilly to sleep at night. It’s a good feeling to know that, little by little, more and more children don’t have to worry about it either. Cozy in their blankets of colored squares, made by many different hands in many different lands, they sleep warmly, wrapped in stitches of love. I can only say I wished I knitted. When things slow down, I may try some of these easy patterns. Thanks so very much for sharing this, Ms. T!!! Thank you for posting this. It looks like a great project for me and Kiddo to take on. Oh Teresa, it is a heartbreaking situation, and seemingly a bottomless pit of need, but initiatives like this are what many communities rely on, especially in the icy winter (plenty of time to knit squares before next cold season as we enter a welcome summer!) There are many child-headed households, and old grannies trying to feed and clothe a village's orphans, so whatever kind individuals around the world can do, brings relief and respite into unimaginable circumstances. Bless you for writing this. this makes me sooooo happyyy !!! This is a very moving article Teresa. I applaud you for bringing this forward. I just heard similar horrifying stories from a young friend of mine who spent time in Calcutta. There are so many people in so many places that could use our help. We, in this rich country of ours, really ought to take time to consider the bounty given us. Our health, family and home are riches not to be dismissed. Teresa, you are great. Thanks! Thanks for this post. I didn't know about this project. The photos are killers! I shared this with several knitting groups, too. This is a wonderful post. When we all come together, what a difference we can make. What a great project. Thank you for posting this information. Thanks for bringing this to our attention. I have lots of spare little bits of warm yarn that I didn't know what to do with! Something that we so take for granted, just being secure, warm, and dry. Oh, how wonderful that you found a way to help! I only wish I knitted too. What a wonderful idea! I may have some yarn scraps and old knitting needles around here still. I'll have to see if I can find them then remember how to knit! How your writing struck a chord with me! Looking at my new grandson warmly wrapped in his moses basket, every child has the right to be nurtured, kept warm and fed. this is so wonderful. i have never known this, and i love to be a part of it. thank u so much for this post.